Finding a good dividend stock to buy is the most stable way to make money in the stock market today. Dividend stocks allow you to earn steady, passive income – on top of any gains the stock provides. That's why we've picked the best dividend stock to buy in 2016. But we're not just picking this stock for its strong dividend. We also like it because it targets the high-growth Internet of Things (IoT) market. The Internet of Things – or the Internet of Everything – describes how every device we own will use embedded sensors to collect information. Basically, every item will become a "smart" version of itself (think smartphone). These devices will have wireless connectivity to the Internet and be able to transmit that information – or "talk" – to other devices. An example of this communication is wearable tech. Fitness-related wearable tech devices from firms like Fitbit Inc. (NYSE: FIT) and Apple Inc. (Nasdaq: AAPL) track various metrics like the number of steps walked and the user's heart rate. These devices work in tandem with computers and the Internet to make it easier for people to monitor their health. But the IoT takes this one step further. By connecting to the IoT, these devices can anonymously collect all of this data and aggregate it for medical research purposes. Data from thousands of wearable tech users can help researchers study diseases and their cures, among other things. The IoT's application to critical fields like healthcare will drive its huge growth over the next decade. According to Cisco Systems Inc. (Nasdaq: CSCO), IoE technology will top $14.4 trillion in sales by 2022. 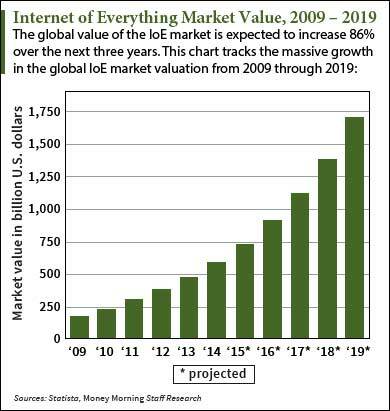 Research site Statista predicts 50.1 billion devices will be connected to the IoT sector – a whopping 118% increase from the 22.9 billion expected to be connected this year. And Money Morning Defense & Tech Specialist Michael A. Robinson – a 34-year Silicon Valley veteran and one of the top tech financial analysts working today – recommends one dividend stock to buy that offers both passive income and 58% upside potential. Our favorite dividend stock to buy that taps into the IoT market is Qualcomm Inc. (Nasdaq: QCOM). Qualcomm is the world's largest producer of mobile chips and sensors. These are essential to every IoT device. Its technology also connects smartphone users to 3G, 4G, and long-term evolution (LTE) wireless networks. One of the company's largest customers is Apple, which uses Qualcomm modems in its iPhones and recently announced it would keep using them in its new iPhone SE. The company boasts a 3.8% yield and has one of the strongest dividend policies in the tech sector. Its annual dividend has increased 149% from $0.85 in 2011 to $2.12 this year. That's more than double Intel Corp.'s (Nasdaq: INTC) $1.04 dividend. But one of the biggest reasons why Qualcomm beats out competitors is its recent acquisition. Last August, the company bought fellow competitor CSR for $2.4 billion. Robinson said its acquisition of the Bluetooth and wireless connectivity company will be a long-term boon for QCOM stock. "CSR ranks as a leader in automotive 'infotainment systems,' telematics, and technology for the Internet of Everything (IoE)," Robinson explained back in September. "This last market is a potential goldmine for Qualcomm." Another attractive aspect is Qualcomm's projected earnings growth. Analysts polled by Thomson First Call expect annual earnings per share (EPS) to increase 36% from $3.01 last year to $4.10 this year. Better yet, that metric is expected to grow another 16% to $4.75 in 2017. With strong earnings projections and a dividend that's increased 149% since 2011 to $2.12, QCOM is the best dividend stock to buy to profit from the IoT industry. We give QCOM stock a one-year target estimate of $79.28. That's a gain of 58% from its last closing price of $50.19. This is based on the company's projected 2017 EPS of $4.75 and its current price/earnings ratio of 16.69. Since QCOM's industry has a higher P/E ratio of 24.8, QCOM stock seems very undervalued, which makes now a good buying opportunity. Stay tuned to Money Morning for more of our best dividend stock picks. Follow us on Twitter and like us on Facebook.